Submit your Lena movie/documentary/TV program reviews to this page! I need people to review movies with Lena that have not been reviewed here. Please e-mail me for further information! 27 September, 1999 : MSNBC presents "Headliners and Legends" with Matt Lauer. The program features a candid interview with Martha Reeves and talks about the career of the Motown Girl Group "Martha Reeves and the Vandellas". 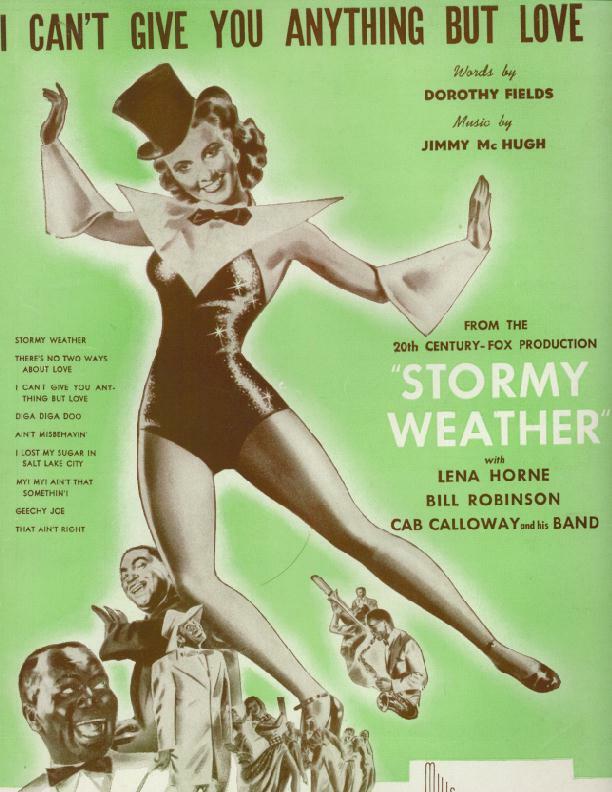 In the documentary, Lena is shown from "Stormy Weather" singing the title song. Lena is mentioned as one of the black celebrities in showbusiness, who proves to be encouragement for young Martha Reeves to pursue singing as a career in showbusiness. However, in the forties and the early part of the fifties, a lot of black music, and R&B, is still marketed as "race records". 20 September, 1999 : Lena's preening Georgia Brown from "Cabin in the Sky" is flashed in a documentary on women in the movies. The documentary covers different categories of women, from femme fatales to suffering women. 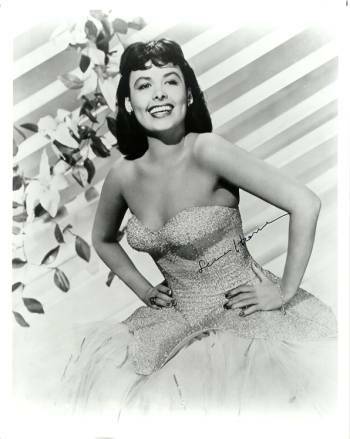 Lena's Georgia Brown makes it in the category "Goddesses", along with Rita Hayworth and Ava Gardner. In the AFI documentary on 100 Greatest Actors and Actresses of all time, a gorgeous still of Lena is flashed briefly at the beginning of the program, while Liza Minnelli is singing the introduction to the program. On TCM, in August 1999, the featured director is Vincente Minnelli and as Liza talks lovingly of the pictures that her father made at Metro, they show Lena singing "Honey in the Honeycomb" briefly from "Cabin in the Sky". In other words, if you look around carefully, Lena appears every now and then on TV. This is ample proof that in spite of her meagre appearances in films, her contribution to the movie musical is not forgotten, nor ever will be. Lena made it to the 100 Greatest Women of Rock 'n' Roll on the VH-1 countdown program of the same name. The list includes other jazz greats such as Ella Fitzgerald, Eartha Kitt, Billie Holiday, Sarah Vaughn, Dinah Washington and Peggy Lee. Lena lands at Number 62. I am a little puzzled as to why Lena would make it to a rock 'n' roll list but it's always nice to see her appear on TV. The program allots a 2-3 minute footage to each artist : some get a little more footage than others. This hugely satisfying documentary on PBS has Lena in a 1996 session talking candidly about her life and career. I was surprised and delighted to catch this documentary recently because I missed it on the the date of original airing : May 19, 1999. Lena still has that twinkle in her eye and giggles childishly as she informally and lovingly sings a few bars of Duke Ellington's "Jump For Joy" as a song that she loved. It's almost strange to see her as an old lady. Still, it's a treat to see this lady going so strong at 79 and being so full of life and so full of good humor. With her long white hair made into a pony tail, Lena rehearses songs in a session in 1996 and talks to the camera. The documentary features many rare stills: with Lennie Hayton, Billy Strayhorn, Duke Ellington, father Teddy Horne, at the Cotton Club, and other influences of her life. At the end, she confidently states that now she has a chance to settle down and rest on her laurels because she is independent, doesn't have to sound like anyone and has nothing to fear. Lena sure has come a long way from those days of struggles and boy, are we all glad to see her doing so well! A virtual treasure-trove of behind-the-scenes stories and footage of Metro musicals made during the golden days when Arthur Freed, Joe Pasternak, Roger Edens and other luminaries were king of the Hollywood musical. Debbie Reynolds introduced Lena's segment. There were clips of "Where or When?" (Words and Music), "Just One of those Things" (Panama Hattie), and "Ain' It the Truth" (Cabin in the Sky - outtake). Lena then introduced Ava Gardner singing "Bill" from "Showboat" (1951) and then sang "Can't Help Lovin' Dat Man Of Mine" from "Till the Clouds Roll By" (1946). Finally, she introduced Judy Garland's segment of the documentary. Lena plays the Good Witch of the West in this all-black remake of "The Wizard of Oz". Also co-stars Michael Jackson and Diana Ross. Lena Horne plays herself as Fred Sanford (Redd Foxx)is taking a tour of CBS Studios, and sneaks off to find Lena when he discovers she's in the building. After Lena finds Fred alone in her dressing room, Fred tells her a lie about his handicapped son, who loves Lena Horne because his mother used to sing "Stormy Weather" to him before his mother died, and the only person that can sing that song like his mother is Lena. She buys the story, and Fred convinces her to come to his house to meet his son. When Fred leaves, he tells his friends, and bets them 15 dollars a piece that he can get Lena to come to the house; a bet that they take because they don't believe that he even met Lena. When she comes to the house, she uncovers Fred's lie and the bet, only to have Fred smooth-talk his way out of the situation, yet again. Lena plays Richard Widmark's mistress in this Western. Lena, comedian Terry Thomas, and Jerry Van Dyke appear as guests in this episode of The Judy Garland Show. The show was taped on July 23, 1963 and aired on October 13, 1963. Judy starts out solo with "Day In, Day Out" and then Lena does her solo bit of the same song. Finally, they both sing a medley of Day In, Day Out/Come Rain or Come Shine. Then comedian Terry Thomas, with his oh-so-terribly-British accent comes in for a bit of comedy, which, believe me, was lost on me! I couldn't wait for Lena or Judy to come on again! Lena sings three great songs after the monotony is over : "I Want to Be Happy", "Where is Love?" and "He Loves Me". The segment of the show where Judy offers a selected guest some tea and makes idle chatter is unfortunately with Terry Thomas. Hence, another few minutes while you watch Mr. Thomas gab away while Judy seems to be having a genuinely good time. Upon Thomas' request, Judy sings "A Foggy Day (in London Town)". The big production number with all the stars and dancers is "Mad Dogs and Englishmen", in which I got to see Lena dancing with non-black dancers (and Terry Thomas) for the first time in her career. It was a miracle, it really was! Anyway, she did a great job! That number marks the last of Lena on the show. The show ends with Judy doing one of her most-requested numbers : a story of her losing the 1954 Academy Award to Grace Kelly and then "The Man That Got Away" from "A Star is Born". The show is entitled "To the Ladies". Four other famous ladies occupy the bill on the episode. Opera singer Mary Costa, comedienne Barbara Heller, former First Lady Eleanor Roosevelt, and dancer Juliet Prowse (fresh from her screen success opposite Frank Sinatra - Cole Porter's "Can Can"). All the ladies here are very talented. I mean Barbara for instance is genuinely funny and does good impersonations of Tallulah Bankhead and Bette Davis. The occasion is Harold Arlen's birthday (Arlen was born on 15th February, 1905). This means that Lena not only sings songs like "Ring The Bell", but also teams up with Frank to do a duet of Harold Arlen songs. I thought the gowns on this program were some of the best ever designed for a TV variety/musical program like this. The last time Lena worked with Harold Arlen was for the Broadway musical "Jamaica" in 1957. This show is a very good showcase of some of the greatest entertainers and vocal talents of all time. The episode before this one guest-starred Ella Fitzgerald. She sang "Can't We Be Friends?" with Frank and the two of them joshed good naturedly, as Frank mentioned in front of Ella (as part of the song) how he loved the singing of several black female vocalists such as Pearl Bailey, Dinah Washington, and Lena Horne, much to Ella's vexation! Ella keeps a straight face even in humorous situations and that itself is funny to see! Lena sings "If You Can Dream", an arrangement by Lennie Hayton. Also co-stars Dan Dailey and Cyd Charisse. Recently, I had the good luck to check out several of Lena's movies. This is one of them. Plot centers around Esther Williams who tries to help out roommate Paula Raymond to catch her boss John Lund's eye. On a night out with Lund and Raymond, Lena appears in a nightclub and sings a terrific "Baby, Come Out of The Clouds". Co-stars Van Johnson competing with John Lund for Esther Williams' hand. Lena appears in a stunning Helen Rose purple post-war outfit and steals the movie with her renditions of Rodgers and Hart's "The Lady is a Tramp" and "Where Or When". Arrangements are by Lennie Hayton, her then husband. Another guest appearance by Lena where she sings a Conrad Salinger arrangement of Hugh Martin and Ralph Blane's "Love" on an exotic set designed by Vincente Minnelli. An ode to her called "Liza" was supposed to have been sung to her by dancer Avon Long, but audiences at the sneak preview were mystified when Lena didn't sing a note in this number. So it was deleted from the film. It is present, though, in its full glory on the "Ziegfeld Follies" soundtrack. Lena appears on stage in the film as part of the show "Showboat" being presented to audiences. The movie is a tribute to the music of Jerome Kern and Lena sings two lovely songs from "Showboat" : "Why Was I Born?" and "Can't Help Lovin' Dat Man Of Mine". Outtakes from the movie include her rendition of "Bill" on the "Lena Horne at MGM" CD. Musical about putting on a show, with George Murphy, Gloria DeHaven, pianist Hazel Scott, singer Ginny Simms and comedienne Nancy Walker. Simms plays the big Hollywood star who George Murphy wants badly to star in his Broadway show. Exotic singer Fernway De La Fer (Lena Horne) sings in a nightclub in an equally exotic outfit meant to show as much flesh as was possible in the Hays Office days. The number is "Brazilian Boogie" written by the smash pair of Hugh Martin and Ralph Blane. The camera starts out with a shot of the drummers and then ends up with Lena's legs and finally her beautiful face. Murphy's father Charles Winninger has showbiz aspirations of his own and steals away Simms, DeHaven and DeHaven's boyfriend Kenny Bowers to star in his own show that he is cooking up, based on his life in vaudeville. 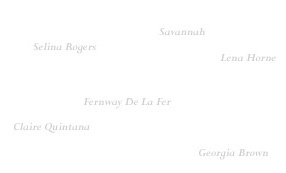 Winninger is also interested in having young and beautiful singer Fernway De La Fer in the show. Eddie Anderson has a comic bit as Horne's wannabe agent. Horne auditions for an impressed cast (including Winninger) in a barn and sings "Somebody Loves Me". Wartime relief Metro musical that cashes in on the craze for big-band music and swing in the forties. This results in the appearance of great big-band vocalists like Harry Babbitt, Sully Mason and Julie Conway (who used to sing with Kay Kyser and his Orchestra) as well as the Professor himself, Kay Kyser. Lena plays herself again in this minor musical with Gloria DeHaven and June Allyson, who play a singing-dancing sister act. The plot involves a mystery donor who donates an empty warehouse and all the frills for the sisters to expand their already existing canteen for soldiers. This plot is a good excuse to showcase Harry James and his Orchestra, big band vocalist Helen Forrest, Lina Romay (with Xavier Cugat), Virginia O'Brien, Gracie Fields and Jose Iturbi. The film shows the usual tendency to throw in a mish-mash of swing and sometimes classical music to make a Metro wartime musical. In the best tradition of something like "Thousands Cheer", of course. Jimmy Durante provides good comic (and musical) relief. Lena stuns in a black dress with glossy upswept hair and sings "Paper Doll". Lena takes over the role of dancer Katherine Dunham (as she had it on Broadway) as seductive Georgia Brown, who causes trouble for both the victim Eddie "Rochester" Anderson as well as his goody-goody wife Ethel Waters. Marked director Vincente Minnelli's directorial debut. I'm sure the intention was to make as humane a film about black people as was possible in 1942, but the plot and the cliches make me wince throughout the picture. Louis Armstrong plays the trumpet to his version of "Ain't It the Truth" and Ethel and Eddie do a sunny version of "Cabin in the Sky". Ethel's rendition of the Arlen-Harburg classic "Happiness Is Just a Thing Called Joe" is terrific and so is Lena's "Life's Full O' Consequence". 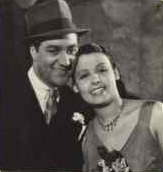 Arlen-Harburg were called in to write some songs for the film because Duke-Latouche were out to war. It's like Lena's tempting the censors in this film with her flashy portrayal of Georgia Brown who coos seductively and kittenishly and isn't shy when it comes to showing her undergarments or a stray thigh! She sings the suggestive "Honey in the Honeycomb" in a night club that later becomes the scene for a shootout involving her, and the holier-than-thou husband and wife team of Eddie Anderson and Ethel Waters. Lena refused to play another whore again in "St. Louis Woman". In the true tradition of one-song appearances, Lena and company give a magnificent rendition of "Jericho". Accompanied by prodigy Hazel Scott on the piano, she sings vocal arrangements by Kay Thompson. The whole song is very intricately arranged with an array of different singing styles by everyone in the chorus. That's the Kay Thompson touch. Co-stars are Red Skelton and Eleanor Powell and critics sometimes called this film "I Overdood It". A flimsy plot is a good excuse to string along a dozen or so production numbers in this movie based on Bill Robinson's character's life. Still, I suppose a flimsy plot that portrays Lena and company as normal human beings is better than a demeaning one full of racist stereotypes like "Cabin in the Sky". One can also forgive the flimsy plot, for the songs and dances are all done excellently by a stellar cast that includes Cab Calloway, Katherine Dunham and her Troupe, the Nicholas Brothers, Ada Brown, Eddie Anderson, Mae Johnson, Dooley Wilson and of course "Fats" Waller. High points : all of Lena's songs, Katherine Dunham's troupe dancing to the music of "Stormy Weather", the Nicholas Brothers dancing with Cab Calloway for his "Jumpin' Jive" number, an unknown youth dancing to the music of "Nobody's Sweetheart", Mae Johnson's "I Lost my Sugar in Salt Lake City", Ada Brown's "That Ain't Right" and Fats Waller's "Ain't Misbehavin'" - in short, all the numbers! Outtake "Good For Nothing Joe" sung by Lena is available on the original soundtrack. Helen Rose's costumes made to depict the World War I era win as usual. Sheet music for "I Can't Give You Anything But Love"
Lena does a guest appearance singing a hot version of "Honeysuckle Rose" with Benny Carter and his Orchestra doing an arrangement by Carter himself. Otherwise, the film includes other guest stars from the Metro lot contributing to the War effort, like Judy Garland, Red Skelton, Margaret O'Brien, Eleanor Powell and Mickey Rooney. Main plot is artificial, about the daughter of an Army Officer's romance (Kathryn Grayson) with G. I. Gene Kelly against her father's (John Boles) wish. Vivacious Grayson and anti-hero-ish Kelly do their best. Official Metro debut for Lena singing the Cole Porter favorite "Just One of Those Things". Lena also returns for "The Sping" with the talented Berry Brothers. Unfortunately, this musical is in black and white. In my opinion, there isn't much plot to keep the audience interested for long. Good comic relief comes in the form of the trio of sailors played by Rags Ragland, Red Skelton, and the very funny MGM musical regular Ben Blue. There is also some deadpan singing from Virginia O'Brien. Also starring Ann Sothern as Panama Hattie. Ralph Cooper, a former bandleader who was once known as "The Bronze Bogart', plays Duke Davis in this lively drama. Duke is the producer, friend and lover of Lena Horne, "The Bronze Nightingale". They tour together in a road show called "Sepia Scandals" until Horne is discovered by a talent agent who wants her to go solo into the big time. Watching it was a real pleasure and the film is a treasure to any Lena Horne fan like us. I watched it with an extra careful eye to see how much of the future Lena Horne I would recognize in this rather unsung role. Here are my observations. Lena was a bit on the plump side, but the beauty was there. The incomparable Horne smile was easily recognizable. She already had a glamorous and elegant appearance and manner. Her manner of speaking sounded rehearsed, as is she was being extra careful in her ennunciation, but she didn't sound the least bit affected. In fact, she spoke better and clearer than I expected. Her singing did not signal that stardom lay ahead for her. Lena was always rather self-effacing about her own talent and never fancied herself a great singer. In watching "The Duke is Tops", it was clear that she had not come under the tutelage of Charlie Barnett, Teddy Wilson, Phil Moore, Lenny Hayton, Duke Ellington, Cab Calloway, Fats Waller, and so many others whom she credits with teaching her a great deal. I did see Phil Moore's name listed in the film's credits and I think I caught him in the background playing the piano with the orchestra in one or two scenes. That trait you noticed and called to my attention--Lena never looking into the camera--was very much her style in "The Duke is Tops." She gesticulated in the same fashion and even moved her head and body is the same manner that she used in later years. In summary, Lena was a diamond in the rough in TDIT. I'm thrilled that you reminded me it was on and that now I can say I've seen it. Ralph Cooper. A very talened man I must say. He could sing and dance. He spoke in a clear and cultured voice. 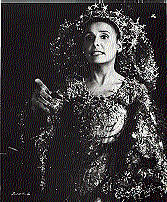 The still you have on your Lena Horne homepage of those two together is from the first scene in the movie. Ted Nesi's Lena Horne Page as part of "Class Act"
"They didn't make me into a maid, but they didn't make me anything else, either. I became a butterfly pinned to a column singing away in Movieland".